SC Lede: Midterms Are Done, Ya Turkey! 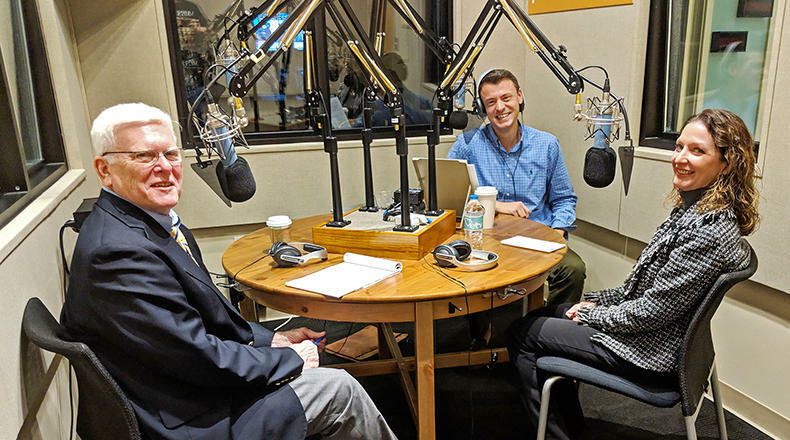 Gavin Jackson speaks with Russ McKinney (l) and Seanna Adcox (r) in the South Carolina Public Radio studios on Tuesday, November 13, 2018. On this last episode of South Carolina Lede before Thanksgiving, host Gavin Jackson looks back on the 2018 South Carolina midterm elections with Seanna Adcox, The Post and Courier's assistant Columbia bureau chief, and Russ McKinney, South Carolina Public Radio's own statehouse reporter. They profile the constitutional officers who were re-elected around the state, look at the state superintendent referendum that failed on the ballot, and discuss issues with South Carolina's outdated voting machines. Russ McKinney then sticks around to quiz Gavin about South Carolina history in this week's Did You Know segment. South Carolina Lede is a production of South Carolina Public Radio and SCETV. The midterms have come and gone and the South Carolina Lede breaks down the results just minutes after they were announced on election night 2018. Host Gavin Jackson recaps the action from the state Republican watch party with reporters Jamie Lovegrove with The Post and Courier and Meg Kinnard with The Associated Press.